Because starting and running a business is hard work, you must have a passion for the type of business you start to keep yourself on task. Also, you must not only have a love of children’s fashion but have a fashion sense about the types of items and styles your customers will purchase while starting an infant garment manufacturing business. The business is as definitely a promising as a profitable venture in clothing or garment industry. Moreover, you can run the business not only as a small-scale basis but it also requires a small startup capital investment. On the other hand, as parental care is an automatic nature of the human mind, they normally want to give the best quality and comfort to their children. And regardless developed or developing economy, infant garments are always on high demand. One of the most lucrative segments in the global apparel industry is the infant garment manufacturing business. This is the same for Bangladesh as well and it’s a large market in the garments industry of the country. Despite their lower household disposable incomes, the large customer base is a major attraction for an emerging economy like Bangladesh. Offering promise for business targeting babies and children, Bangladesh has experienced both baby and economic booms in the past decades. While clothing that has dangling strings, tassels and ribbons are basically avoided, one-piece outfits are popular as they are easy to get on and off. In this case, cotton is mostly sought as a natural fabric. When parents buy clothes for their babies and children, they consider thing including comfort, safety, and ease. In the infant garment manufacturing business industry, children’s clothes are a relatively recent invention. Children wore miniature versions of adult costumes from the rudimentary beginnings of clothing all the way to the nineteenth century. When we talk about infant garment, there were a few minor exceptions. As the child could be tethered out of harm’s way, children’s clothes often had leading strings sewn in them. This is because babies probably had more clothing challenges than any other group. And when you’re in this business you have to go with various steps. 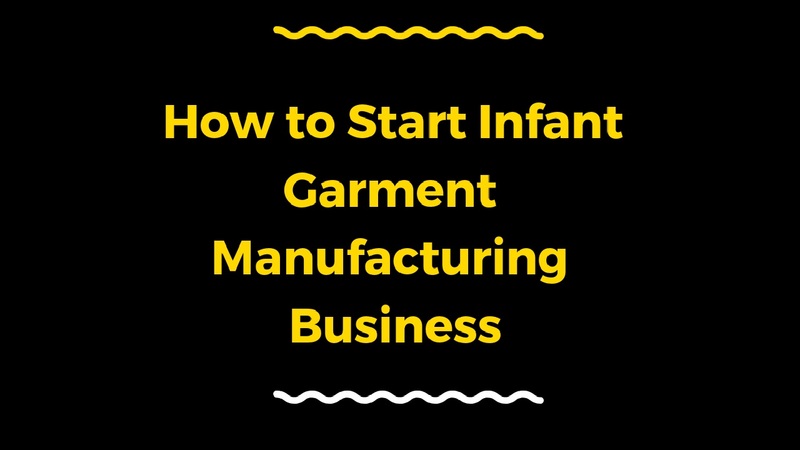 Well, let’s know what the steps are to follow while starting an infant garment manufacturing business. While creating a business plan, you should pay special attention to your competitor’s pricing to make sure you can be competitive. It’s a part of a business plan to decide how much you’ll charge along with your profit for the children’s fashion. As it shows where you are and where you are going, a business plan is the best start you can give to any new business. The calculation of manpower investment is crucial, as an infant garment manufacturing business is a labor intensive operation. According to your investment capacity and desired output, it’s advisable to prepare a detailed project report. You can apply for a project loan as any other manufacturing business. Also, you have a chance to apply separately for working capital and fixed capital loan. Apart from these, angel investment is also a good opportunity for this type of business. Although you must take maximum care in selecting the machinery and other electrical equipment, you need to ensure minimum power consumption. You’ll need to have some machinery while starting an infant garment manufacturing business. The quality of the fabric used can make quality infant garments accordingly. So, while purchasing fabrics to ensure good color fastness, you must take care. It’s an excellent way to get new customers into your business by arranging a grand opening. Also, it’s a good start to make an eye-catching announcement in your local newspaper. As a sale strategy, you can include a coupon in the ad with the offer of a special deal for the grand opening. In order to collect their email address in exchange for a store discount, get customers to sign in and give you consent to send periodic sales announcements. Although you’ll want to be sure that your books are set up properly, you should know whether you’re paying your taxes on time. This is because you need an accountant to keep running everything smoothly. Moreover, when you have an accountant, he or she will help you get all of the licenses and pay all the fees you must take care of. You need a business location while starting an infant garment manufacturing business. An area that gets plenty of traffic, their retail shops do best. And the next to other shops that sell other children’s items, it’s better if you can locate a storefront. This is basically useful and essential for your business show and a part of business marketing.